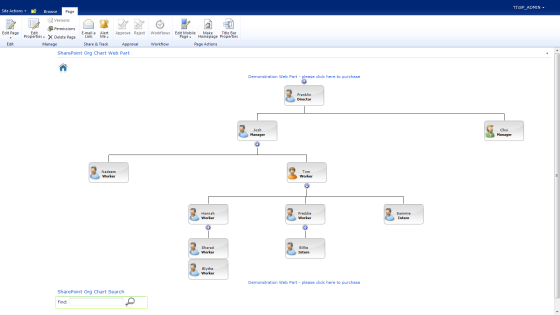 The SharePoint Org Chart Web Part allows page creators to set up to six rules that can change the color of an individual box on the organisation chart depending on the condition of that rule. The supported Operators are listed below. Disabled - This rule will not run. Contains - Does the Field contain the Value. This is case-insensitive. EndsWith - Does the Field end with the Value. This is case-insensitive. EqualTo - Does the Field equals the Value. Values can be a number, text or date. GreaterThan - Is the Field greater than the Value. Values can be a number or date. GreaterThanOrEqual - Is the Field greater than the Value. Values can be a number or date. InList - Does the Field contain one of the Values. Values are separated by a comman. For example Red, Green, Blue, Black. 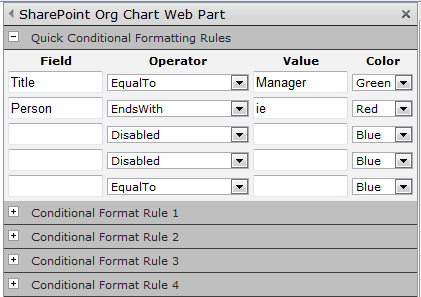 IsFalse - This is the style of line used to join the assistant to the chart. It can be Solid, Dotted or Dashed. LessThan - Is the Field less than the given value. Values can be a number or date. LessThanOrEqual - Is the Field less than or Equat to the value. Values can be a number or date. MatchesRegexp - Does the Field match the Regular Expression. See Regular Expressions for more details. NotEqual - Does the Field not equal the given value. StartsWith - Does the Field start with the Value. This is case-insensitive. Rules are applied on a First Rule Wins basis. 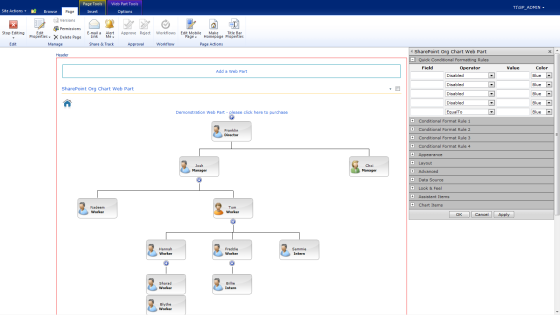 The page developer has created an Org Chart using the styling properties exposed in the Chart Items property section. 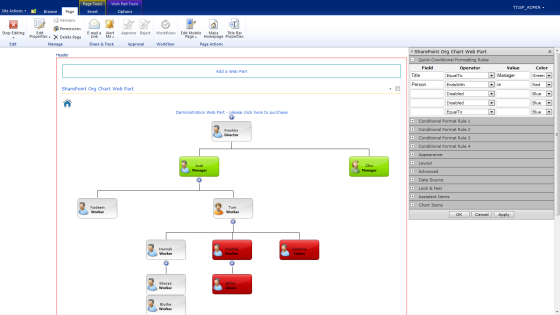 Whilst this is good for quickly presenting an atractive chart simple colour coding can bring the chart to life and allow easy visualisation of complex data. 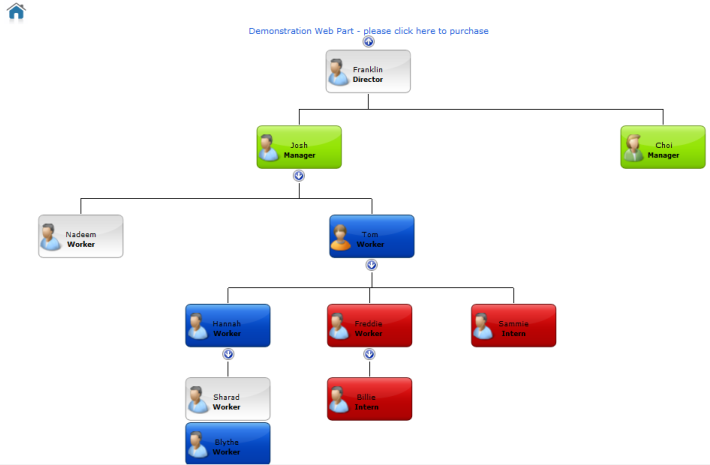 Enter Page Edit mode and select the Edit Web Part menu item on the SharePoint Org Chart. 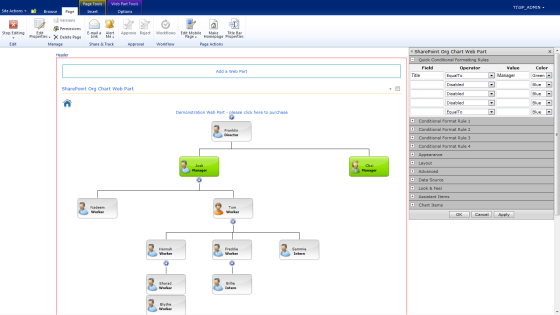 A Color is selected from the final drop down list. This is the color that the background of the item will be set to if the rule is evaluated as true. 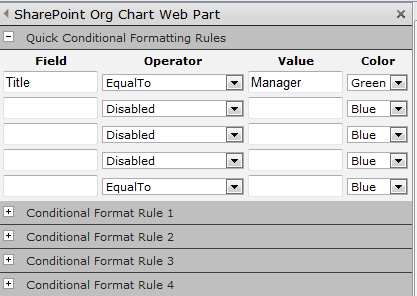 The first rule in the example checks that the Title ( Field ) is EqualTo ( Operator ) Manager ( Value ). The page developer has choosen Green as the color to be applied if the rule is evaluated as true. Once the rule has been applied the two managers Josh and Choi are shown in green. 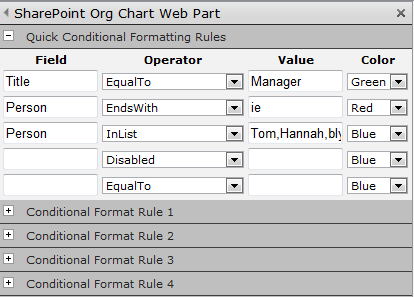 The next rule checks the Person ( Field ) to see if it EndsWith ( Operator ) ie ( Value ). If so the boxes will be drawn in Red ( Color ). Pressing apply changes Freddie, Sammie and Billie to red. If so the color is set to blue. The final colored chart can be seen below. 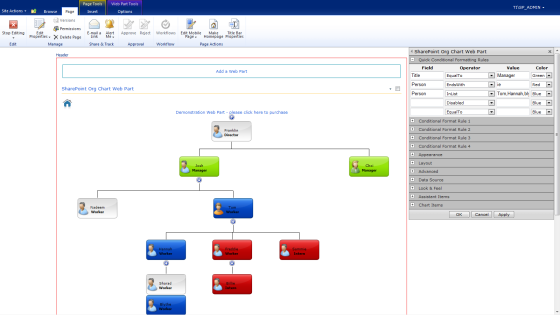 Adding colors to the organisation chart can make it easy to visualise trends and data.